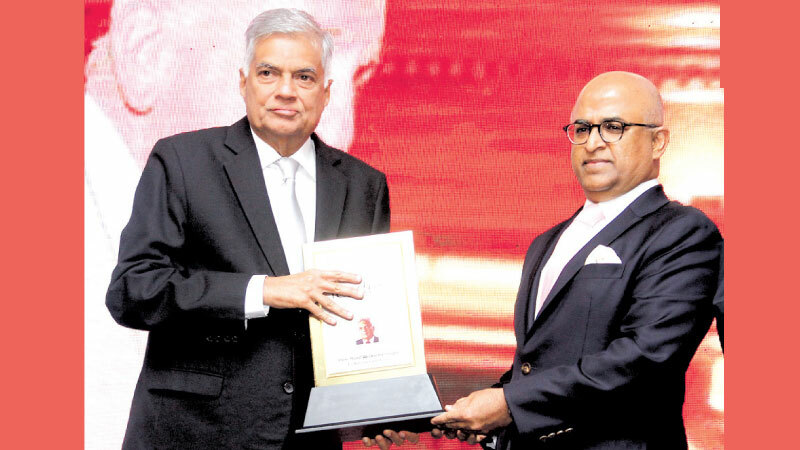 Prime Minister Ranil Wickremesinghe receives the Most Admired National Leader in Sri Lanka Award from International Chamber of Commerce (ICC) India President Jawahar Vadivelu. The inaugural ‘Most Admired Companies of Sri Lanka’ event jointly hosted by International Chamber of Commerce, Sri Lanka (ICCSL) and the Chartered Institute of Management Accountants (CIMA) Sri Lanka was held at Shangri-La, Colombo last Sunday. 15 institutions and Prime Minister Ranil Wickremesinghe were honoured at the event. The landmark event saw the participation of Sri Lanka’s most successful listed and non-listed corporates, while Prime Minister Ranil Wickremesinghe attended as the Chief Guest. CIMA President Steven Swientozielskyj and ICC India President Jawahar Vadivelu were the Guests of Honour. Prime Minister Ranil Wickremesinghe received the Most Admired National Leader in Sri Lanka Award from International Chamber of Commerce (ICC) India President Jawahar Vadivelu and ICC Sri Lanka President Dinesh Weerakkody. The awards were presented following a lengthy and rigorous evaluation, based on globally accepted quantitative and qualitative criteria, overseen by an eminent and distinguished panel of judges. They included - Awards Evaluation Committee Chairman, Ravi Abeysuriya, Sri Lanka Tourism Promotion Bureau, Managing Director, Sutheash Balasubramaniam, legal luminary and President’s Counsel, Harsha Cabraal, Export Development Board’s Chairperson, Indira Malwatte, KPMG Middle East and South Asia Regional Chairman Reyaz Mihular, Prof. Kapila Perera and AIA Insurance Lanka Plc Director Deepal Sooriyaarachchi. The ranking was based on many parameters which included corporate governance, impact on society, product and service quality, innovation, quality of leadership, employee empowerment and business footprint, with the top ten companies being selected from 120 entries. The awards, the first of its kind to be introduced, created wide interest among the business community here in Sri Lanka due to the recognition it will bestow on the companies. The companies thus chosen have not only achieved outstanding financial performance but also built a strong corporate reputation over the years. These companies have achieved business excellence in a sustainable and ethical way for their employees, customers, investors, and the general community. CIMA Country Manager for Sri Lanka, Zahara Ansary earlier said, “The stringent criteria in place to select the Top 10 ensures that these awards are in line with reputed International Rankings. We believe the participants and the winners will gain significantly by being a part of this competition. CIMA has always been in the forefront of helping businesses to succeed and this time we wish to get our Sri Lankan companies the highest recognition they truly deserve”.